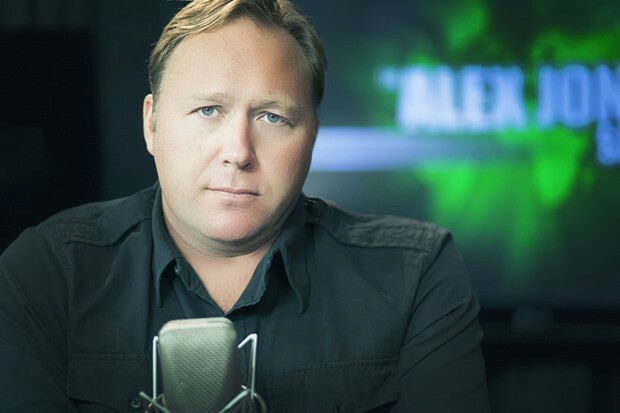 As a part of our attitude change propaganda series today we are looking at Alex Jones. Alex Jones uses several tricks to make his site look like a real information source. Aside from slick graphics that make parts of his site look like other legitimate news sites, he takes work from credible publications such as Human Events, recycles them with his hype and conspiracy theories added, and then tells people that the ONLY source of this information is him and that everyone else conspires to keep this from them (OK that one is partially true). Like all conspiracy theorists such as “9/11 truthers” those who effectively disagree with Jones automatically become a part of “the conspiracy”. Jones uses a regular formula for what he puts out to keep his readers and listeners hooked. Jones mixes 1/3 to 2/3 of real facts with over-hype and his cult of personality conspiracy language. He will show you A + B & then how A + B = C, and then say this is why his X Y Z narrative is completely true. Jones does not explain or demonstrate how he makes the leap from ABC to XYZ in his narrative. Conveniently, when you argue with Jones he throws what is true about the A B C part of his narrative in your face and accuses you of lying or being against “the facts”. Jones does same thing that Donald Trump did in his demonization of China in his “almost” presidential campaign – ‘IT’S THEM! THEY CHEATED! THEY did this to YOU!’ Now granted China does not play fair, but the truth is that China uses our leaders’ own stupidity against us. While China most certainly intends to damage us to a degree, it is no where near the damage caused by our own deeply flawed leaders. The victim card is mighty seductive to those who have not steeled themselves against it. Those who are new to politics risk getting caught up with Jones pretty easily. Few will deny that Jones is entertaining. He is a cult of personality propagandist who leverages the appeal of a cloak and dagger soap opera. People who believe Jones over time become emotionally attached, they “believe in Alex” and it becomes less and less about facts or policy. Being a “Joneser” effectively renders someone politically powerless. Jonser’s mostly talk amongst themselves but never gain any political power as those with political experience ignore them. Jonser’s, like most people caught in a cult of personality, are virtually immune to any evidence that indicates that Jones is flawed. This entry was posted in Communications Theory, Dirty Tricks, Editorial, Propaganda. Bookmark the permalink.